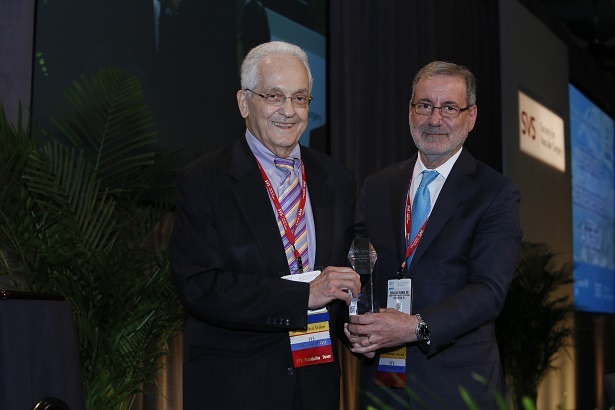 June 22, 2017 – Dr. Herbert Dardik, chief emeritus of vascular surgery and general surgery at Englewood Hospital and Medical Center in Englewood, N.J., was awarded the distinguished Lifetime Achievement Award by the Society for Vascular Surgery (SVS) at the organization’s annual meeting in early June. The award is the highest honor SVS bestows on one of its members. Selection for this honor recognizes an individual’s outstanding and sustained contributions to the profession and the Society, along with exemplary professional practice and leadership. Dr. Dardik, 82, still maintains office hours, runs student and resident programs and works in his vascular lab. He was recognized for his tireless contributions over many decades to the specialty as a physician, surgeon, teacher, researcher, clinician, community practitioner and academician. For the Society, he is the first community practitioner to receive the award. “In every way Dr. Dardik is a shining example, thanks to his contributions to research, science, practice and leadership, and his never-say-quit work ethic,” said Society President Dr. Ron Fairman while presenting the award. Over the course of his career, Dr. Dardik has earned a prestigious reputation for many of his contributions and innovations in field of medicine including innovations in resident training for vascular surgery, contributions in clinical research in lower extremity bypass patency studies, evaluation of thrombolytics, and work with small vessel bypass, exposure, technique, indications and outcomes. He is director and founding member of the bloodless medicine and surgery program for the avoidance of blood transfusions and in developing blood conservation techniques. Dr. Dardik has given more than 450 invited lectures, chaired the annual Vascular Symposium for 15 years and started one of the first approved noninvasive vascular laboratories. Further contributions include his work on the nationalization of the Society for Clinical Vascular Surgery and as a founding member of the Eastern Vascular Society and the Vascular Society of New Jersey, all three of which he served as president.